Our event rooms have a touch of quality and good taste that will make your event a success. 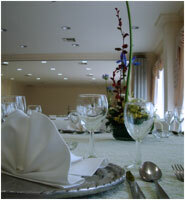 You can choose Hotel Chulavista as your reunion center. A fully equiped business center and a meeting room is available for all your activities. Also Hotel Chulavista is all set for any kind of social events such as weddings, XV year celebrations, graduations, baby showers, bachelorette parties. Our excellent facilities, three modular rooms with a capacity for up to 220 people, and our more than 50 years of experience in service will make your events unforgetable.